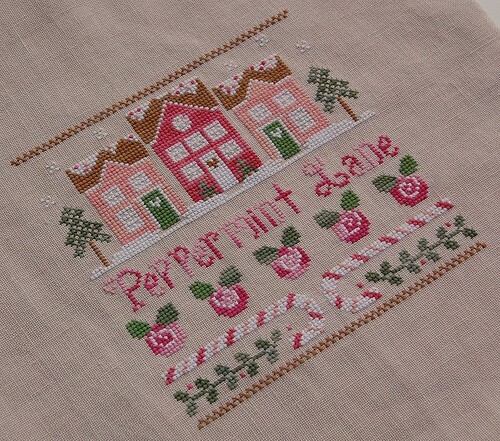 Nicole's Needlework: Peppermint Lane Finished! Country Cottage Needleworks "Peppermint Lane"
Wow, that was quick! It looks lovely! I bet you enjoyed that stitch. The colours are lovely. Congrats! Now I await to see your Peppermint Twist. Congrats on your lovely finish! we need to come up with a name for you Nicole with your stitching speed! LOL Nitro Nicole? LOL Great finish! I will be starting Peppermint Twist at the beginning of the year but sure you will be finished with it by then. What a pretty finish! I love the colors. Congrats Nicole! Wow Nicole! You are fast! I feel ashamed to still be working on my small piece! I am hoping to try my hand at framing this week. Wish me luck! Just beautiful! I love the overdyed fibers in this one! Very sweet and lovely finish Nicole! Lovely finish Nicole! I also love your dish cloths-are they crochet or knitted! ~~HAPPY DANCE AND CONGRATS~~ on your beautiful finish!! Good job! It looks great! What a quick stitch. Very cute, Nicole. I love the colors! That's gorgeous - I love it! And beautifully stitched too! Oh my goodness this is gorgeous! I have it all kitted up but no time to start it yet - maybe over Christmas vacation. I just love this piece. Wonderful work Nicole - have a happy holiday! Ohh, isn't it adorable?. Congratulations, it's lovely.